He was born in Buhl, Idaho, on May 27, 2007. He died in his backyard in Oregon City, Oregon, on September 1, 2017. The dash between those dates contains a full life, a lot of heart, and many friendships. Murphy was always the darling of his human father: they learned how to hunt upland game birds together, they hiked, they did trail work, they camped out. No dog has ever been as excited to see the orange shock collar than Murphy: it meant only one thing: an adventure somewhere! He loved to hunt Chukar in the Steens Mountains. Murphy had a checkered history with his human mother, from the moment he rode home in her lap and ate her hairbrush. He ate her glasses in a show of affection one night. He didn’t understand hierarchy, and had to learn that he was Number 3, after Mom. Mom frequently referred to him as “Dammit!”, “Getoutoftheway!”, or “Stopit!” Murphy was always excited to see her, and could sometimes coax her to play “stick” with him, a sort of fetch game he made up himself (“Catch me if you can! combined with Okay, now you have to throw it!”). In June of 2010, Murphy helped adopt his little brother, Harvey. They were instant packmates: Murphy, the Alpha, and Harvey, the lackadaisacal. They had few disagreements, and only one spat: gravy. When it came to gravy, Harvey was the Alpha and Murphy walked away with blood on his ears. 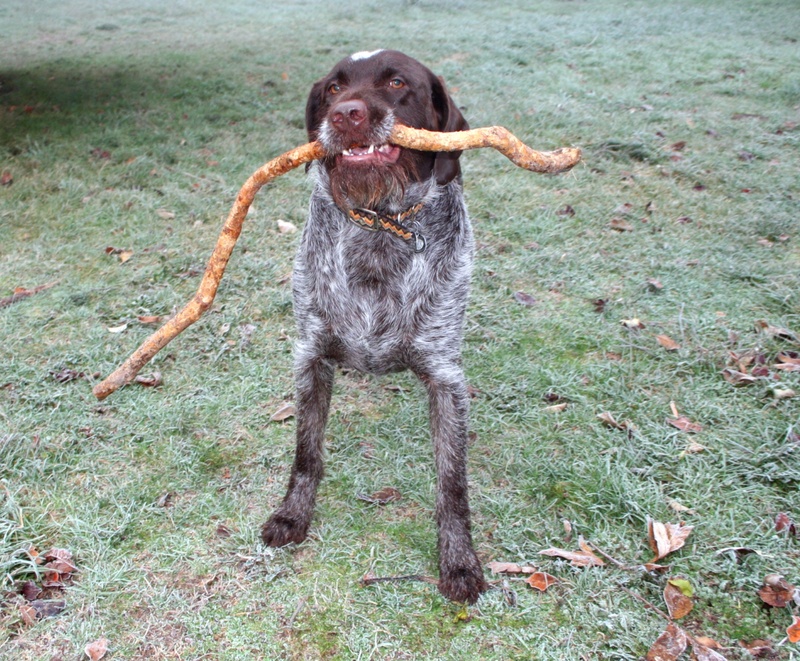 Murphy tried his best to teach Harvey how to play, and even succeeded to a small degree. The week before Murphy came down ill, he tried to get Harvey to play, but the Harvemeister has lost all energy for such trivial pursuits. It was expected that Harvey would be put down long before Murphy would. The sudden onset of congestive heart failure in Murphy stunned everyone. There were no classic warning signs: Harvey has the signs, but no enlarged heart and no arrythmia. Murphy went from a dog with an acute sense of humor to collapse within the span of seven days. In his lifetime, Murphy made his first retrieve in the same spot he would later die. He discovered snow, pools of water, and the freedom of the wide open spaces. His first emergency room trip was due to anaphylactic shock after running into a nest of yellowjackets while hiking: he forever held a grudge against all bees, wasps, and hornets. He loved beer, and would sing for it. He considered it an honor to sleep on top of someone, preferably a human (Harvey was something of a grouch about that). He ate tissues and paper towels, sticks in the yard, and probably something poisonous at least once. He was ever on guard against cats, rats, moles, gophers, crows, tweety-birds, people walking on the street past the house, and anyone not watching their plate of food at a camp-out. He loved to roll in smelly things, but he learned to draw the line at skunks – but only after the third bath in hydrogen peroxide, baking soda, and tomato sauce. In his youth, he joined Trail Advocates with his human dad. They spent hours with Charles, locating and documenting hundreds of old CCC trails, USFS trails, and Native American trails throughout the northern Cascades. Murphy was a better “bird dog” for finding trails than any human (possibly because he was lower to the ground and could go under rhododendrons). He will be sorely missed by his comrades. He made his last trip to the Doggy ER on August 31st. The attending veterinarian gave him a choice: die now, or have an EKG in the morning to see how damaged his heart was. Murphy declined both, indicating his preference to die outside, in the open, with family. Murphy collapsed during the night, and his human dad spent the night with him in the same spot he once made his first retrieve. A wake was held on the morning of September first. Attending were: his human dad (Donald), his human mom (Jaci), his little brother (Harvey, who now outweighed him by ten pounds), and two rufous-sided hummingbirds. The hummingbirds were especially curious and close. Murphy is mourned by many. The outpouring of love on Facebook, Instagram, and by email has been overwhelming for his family. The hummingbirds don’t know what to make of their new-found freedom at the feeders. Murphy’s hiking buddy, Charles, wept openly on the phone when he heard the news. Only Harvey seems unaffected by the loss, and that is possibly due to the fact that he is a dog and self-centered. He does know he hasn’t been challenged for a dog biscuit in three days and that noone has bugged him to try to play recently. The Presleys have actively avoided being home for the weekend, so they didn’t have to face the empty house and quiet backyard. The crows tried to entice a fight with Harvey, but left disappointed. The honey bees, bumble bees, and wasps have gone on doing their thing, unaware of how close they came to annihilation during Murphy’s lifetime. Guests may now enter the Presley home without a TSA-level crotch sniffing. Murphy has been cremated and his ashes spread to whatever wind. The veterinarian who made the house call announced after doing a heart check, “There’s no one in there now” and “he’s off chasing chukar in the Steens now.” There’s no better epitaph than that. Thank you to all who supported us during this time. We know Hurricane Harvey (so mis-named as Harvey is in no way a hurricane nor a storm) and the threat of wildfires, Hurricane Irma, and North Korea are considerably more than the loss of a dog. But a dog is everything. Anyone who has been privileged to be loved by a dog so loyal knows. We had our real first frost yesterday and today. 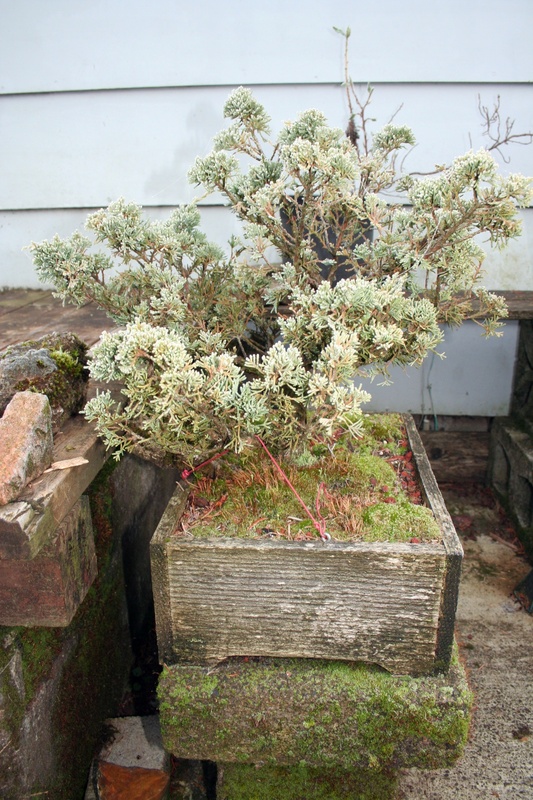 This morning, I thought I would run out and get photos of Don’s Bonsai in frost and call that the photo of the day. I put my camera on “rapid shoot”. Murphy sort of went crazy on me. It was so funny. I took one photo, then set my camera on “rapid fire” and proceeded to follow him around the yard. he was sure I was playing with him, and he grabbed that darn stick. It was hard to keep him in focus. “Oh, yes, but good things about Murphy.” I didn’t tell him I was posting this tonight.